XML is a well structured text file, we can store any kind structured data in XML file. In most of the times our applications demand us to maintain a structured data in XML or Database. C# class object is one of the well structured data. In dynamic applications, we can store and retrieve C# class object from XMl file as per our need. In this article I am going write C# code Convert C# Class Object to XML and Vice Versa. 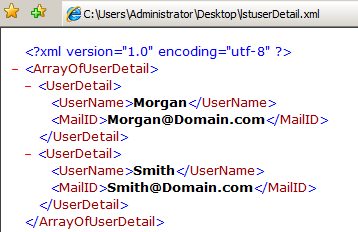 Xml Output for list of class object(List<UserDetail>): You will get below Xml data when you convert list of class object (List<UserDetail>) into Xml. Use the below function to convert XML string into C# Class Object using XmlSerializer and StringReader.